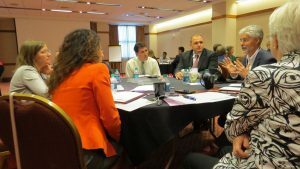 On Friday, October 6, 2017, representatives from all 4-VA schools came together for the first General Education Summit, held at Virginia Tech. The summit was developed by team leaders from each school, including Meg Mulrooney (JMU), Rachel Most (UVA), Jeanie Kline (ODU), Deborah Noble-Triplett (VCU), Bethany Usher and Janette Muir (GMU), and hosted by Stephen Biscotte (VT). Members of the teams brought expertise related to all things general education, from faculty governance and professional development to enrollment management and budgeting. Attendees reported that the summit challenged many of their assumptions about the practice of general education in the state of Virginia. Melissa Broeckelman-Post, a member of the Mason Core Committee at GMU said, “Our perception is that students transfer from community college to us [GMU], but not among us.… Now we can say almost all of us have X course, and what can we do to make it possible to transfer among ourselves?” Judy Giering, the director of Learning Design and Technology at UVA said, “We saw the innovative practice of curricular integration as an opportunity to challenge faculty’s perception of their teaching.” Other attendees commented that the summit was helpful because they want to know what colleagues around the state are doing but lack the time and resources to conduct that research. 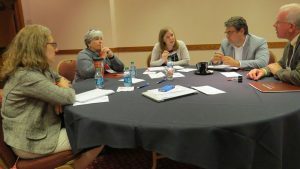 Through the summit, attendees heard personal stories regarding the transformation of general education across the state and reviewed information that may be difficult to find on the public-facing areas of our university websites. Leaders from each institution began the meeting by sharing the current status and structure of general education at each campus including ongoing transformation and future goals. An update was then provided by Paul Smith and Jodi Fisler from the State Commission for Higher Education in Virginia regarding House Bill 1662, Senate Bill 1234, and the latest assessment policy. Discussion around the implications for general education and how input from the summit might inform future implementation ensued. 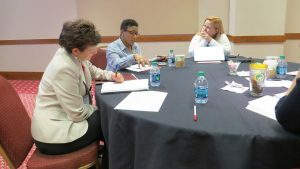 The remainder of the summit was dedicated to facilitating discussion around key topics such as enrollment management, supporting transfer students, and transfer equivalencies. Team leaders anticipate that one of the outcomes of the summit will be the development of a white paper that represents the shared goals, challenges and curricular innovation opportunities of general education across the commonwealth.